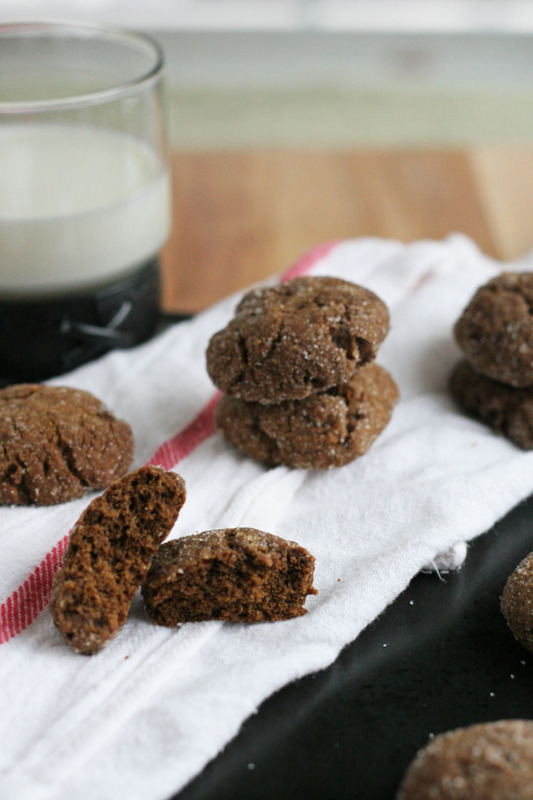 Ginger molasses cookies have history in my life…Holidays mean holiday cookies! It means a lot more, I know, I am just really excited about cookies as much as relaxing, family time, and Christmas trees. I love it all! This year we are taking two weeks off at the end of the year, a well deserved, long time coming vacation. Or stay-cation! Which needs cookies. We all need cookies, it’s a thing. Even if you don’t love cookies, you eat them during this time of year. I know you do, because I was there. I was there in a bakery making those cookies, thousands of them, so many of them I still have dreams about it. Oh and a permanent callous from scooping cookies. No joke. This was a couple of years ago, here in Portland. It’s the best bakery in Portland in my opinion, even before I worked there. It’s top three best bakeries on the West coast. The sheer perfection and high standard that comes from that bakery was astonishing. I was in charge of holiday baking. Think ginger, gingerbread, crackles, cranberries, you name it, I made it in small batch droves. And ginger molasses cookies was on the menu of course. I haven’t made them since I worked there two years ago. That is how many I made, I steered clear of holiday baking until this Christmas, I made too many cookies that year. Don’t get me wrong, I loved working there, and I love baking clearly. But seriously, I made so many cookies in a three month period, that I had a blister from the scoop. Now, I learned so much from working there. Invaluable experience is how I have always described it, a memorable invaluable experience. So now that is has been years since I have made these cookies, I felt it was time to bake them again. It’s been long enough. While this is not the recipe from Baker & Spice, this is similar in flavor and texture. Honestly, I can’t remember the exact recipe, nor would I be able to share it with if I did lol! I signed a contract :). I’ll be sharing this recipe on ABC’S KATU AM Northwest Portland, and here is the TV segment! Place rack in center of oven, and preheat to 375 degrees. Place coarse sugar in a shallow bowl or pyrex. 1. In a medium bowl, combine flour, baking soda, cinnamon, ginger, salt, and cardamom. Whisk to combine. Place egg, butter, sugar, and molasses in a small bowl, whisk to combine. Add egg mixture to flour, use a spatula to gently combined. 2. 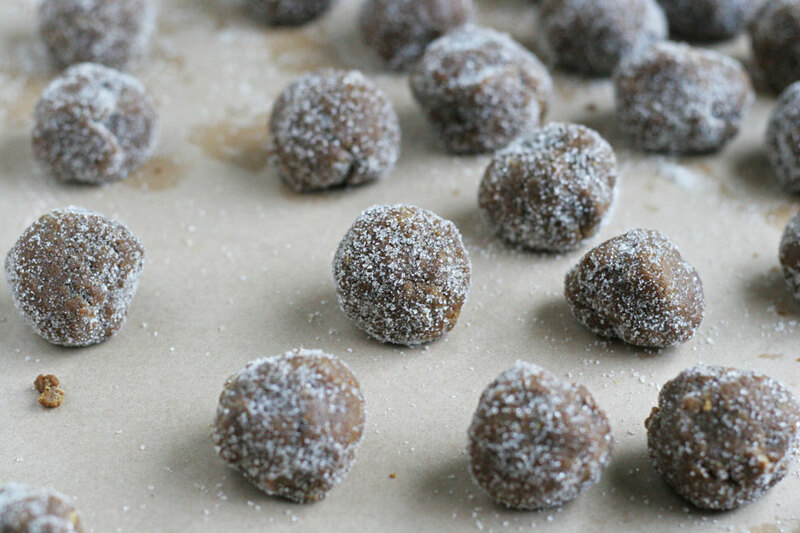 Scoop 1 tablespoon of dough, roll into balls, and toss in sugar. Place in fridge for 30 minutes. Place dough on a parchment lined baking sheet, 2 inches apart. Place in oven and bake for 8-10 minutes. Allow to cool for 10 minutes on a wire cooling rack. Store in an airtight container for up to a week. These can be made up to 2 weeks in advance. Place dough in an airtight bag or container in the freezer. Bake straight out of freezer. The cookies I drooled over on instagram! So glad there’s a recipe for them now. Drool away girl, I loved making these cookies! If there’s no room in the fridge for the cookies rolled up, can we put them in the fridge before being rolled and tossed in sugar? Honestly, I wouldn’t recommend it because they warm up with your hands rolling them up. The point is to be cold when going in the oven. So I would put them on a small plate or pile them in a small tupperware that can take up less space. Does that help? These are one of my favorite classic holiday cookies. I make ginger cookies each year for Christmas. They are my fav! I’m sure I’d love these too. 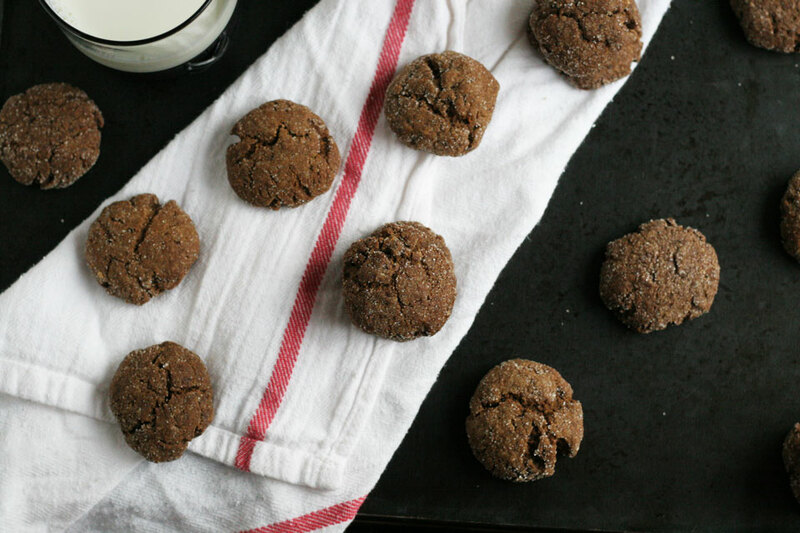 My family loves molasses cookies, especially with lots of spices like ginger and cinnamon. Thanks for sharing this wonderful recipe! I love this alternative to a gingerbread cookie, they are so much more enjoyable! These are simply fabulous. I truly love their soft, chewiness. Ginger and molasses are so good in cookies. These look so thick, I love them! These have to be some of the most classic holiday cookies ever, hands down! I always think of ginger molasses before anything else. That sugar crust! YAY.